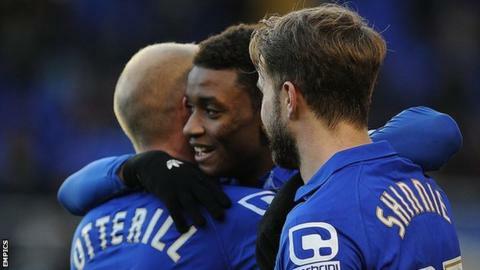 Birmingham City teenage forward Demarai Gray is keen to build on the feeling of local pride he got from registering his first professional hat-trick. The 18-year-old claimed a treble in the space of 34 first-half minutes in Saturday's 6-1 thrashing of Reading. "It was a nice feeling for myself," he told BBC WM. "I'm a Birmingham boy and I've been at the club since I was 10. "I know fans like to see local players and playing for the Blues first team means everything to me." Gray, who made his debut in October 2013 as a 17-year-old, netted his first Blues goal in April in a 4-2 home defeat by Blackburn and scored for the first time this season in September's 2-2 draw at Norwich. At 18 years and 169 days, Demarai Gray is the youngest Blues player to hit a hat-trick since Trevor Francis in February 1971. Aged just 16 and making his sixth appearance, Francis scored four goals in a game against Bolton. The last teenager to score a hat-trick for Blues was 19-year-old Chris Wood, on loan from West Bromwich Albion, in September 2011. Jesse Lingard, on loan from Manchester United, scored four times on his debut as a 20-year-old last season against Sheffield Wednesday. But he admits that for all the creative ability he has shown in his 10 starts for Blues, he always thought he had more goals in him. "I've been looking to score more goals," he added. "Now I just want to kick on for the rest of the season. "With Andy Shinnie in there, it makes it more difficult for the opposition and creates more space for me and David Cotterill." Birmingham, who have climbed to 15th in the Championship table, have lost just one of their seven matches since Gary Rowett took charge on 27 October, lifting them seven points clear of the relegation zone. Meanwhile, Blues have revealed that former chairman Peter Pannu has now severed all ties with the club. Just four days after resigning from the Blues board, his roles of managing director and chief executive have been terminated with City's parent company Birmingham International Holdings Ltd, who feel it "inappropriate" for him to carry on.